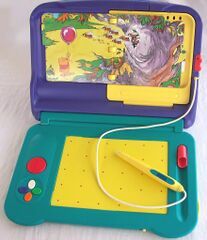 The Sega Pico, known in Japan as the Kids Computer Pico (キッズコンピューター・ピコ) and later the Kids Communication Pico (キッズコミュニケーション・ピコ), is a video game console made by Sega, aimed at young children between the ages of 2 and 8. The Pico was Sega's first "educational" console, running in parallel with more traditional games consoles aimed at the mass market. Debuting in mid-1993, the Pico was supported in Japan until 2005 when its successor, the Advanced Pico Beena was released. Though relatively obscure in the eyes of many, the Pico stands as one of the most successful devices of its kind, being the first educational console to ship globally and the primary inspiration for devices from LeapFrog or VTech which emerged in the years that followed. It was the first console to use touch controls as the default control scheme (the first in general was the Sega SG-1000's optional Sega Graphic Board controller). It was also the earliest known device to use active digitizer technology. The Pico can be seen as an odd hybrid between a traditional cartridge-based video game console, a graphics tablet and an electronic book reader. It is a sturdy yet colourful device designed to both appeal to and "survive" the torment of young children. Though not invincible, Picos can cope with small bumps and spillages with greater ease than mass-market consoles, and feature no small parts or hazards unsuitable for small children. All Picos are built similarly to modern day laptops, in that they are devices made up of two, foldable halves allowing for portability and easy storage. The bottom half rests on a flat surface and acts as the primary source of input, while the top is held at a 90-degree angle, supported by a support at the back. Also included is a handle for easy transportation, and with the exception of TV and power connectors, everything is built-in to the unit. The Pico has five, unlabeled face buttons on the bottom left - one large button (often mistaken for a d-pad), and four smaller , , and buttons. Most notably, the Pico has a "touch pad" and a hard-wired "Magic Pen" for manipulating this pad (the Magic Pen also acts an extra button when pressed down). Picos also have an expansion port on the right hand side, and in early models, a DE-9 port, which is presumed to have gone unused. Picos, like most home consoles, connect to televisions. Interestingly the Pico relies on composite video for its display, as opposed to the then-standard RF technology, providing better image quality than many other systems of the era. The Pico also needs an AC adaptor, similar to those used with the Sega Mega Drive Model 2 and Sega 32X. Pico cartridges are affectionately called "storyware", with each cartridge shaped like a book with multiple "pages". Cartridges plug into the top half of the system and pages open out to fill the space, with games recognising which pages have been turned and changing the TV display accordingly. The Pico's cartridge slot "pivots", meaning cartridges can be placed in the system at an angle and locked into place when in use. The last "page" of each cartridge can also be manipulated by the Magic Pen, effectively creating two touch pads. Much of the Pico's success came from its ability to support extra peripherals. For example, the Drive Pico mounts a large, plastic steering wheel on top of the touch pad, and gives the user an alternative way to play specific games. Though no such peripherals were released in North America or Europe, dozens were released in Japan and markets such as South Korea, particularly towards the end of the system's lifespan. From a technical perspective, the Sega Pico uses hardware derived from the Sega Mega Drive, lacking only a Zilog Z80 and a YM2612 for driving FM Sound. Also, strictly speaking the touch pad technology uses electromagnetism to send signals, and therefore does not need to physically touch the device in order to operate. Main article: Sega Pico Models. For the most part, aside from cosmetic changes, Pico consoles remained unchanged throughout their lifespan. The system is also region-free, though NTSC/PAL differences must be considered. Later editions, such as the Beena, add basic internet support. For the most part, however, all Pico software is compatible with all Pico units. The one exception is a derivative console developed by Yamaha - the Mixt Book Player Copera. This device adds extra sound hardware, and software designed to take advantage of this will not function correctly in non-Copera Picos. ROM: "Storyware" cartridges of various sizes. Video: YM7101 ASIC, which was replaced with an FQ8007 ASIC in newer units. Sound: Texas Instruments SN76489 programmable sound generator and an NEC µPD7759 PCM chip. Input: "Magic pen" with an action button at its tip, a four button directional pad, and one on-board action button. By the time of the early 1990s, electronic toys were on the rise, and Sega, a company at its peak decided to create a home console geared towards a younger audience. The result was the Sega Pico, a device derived from the popular Sega Mega Drive console. "Pico", like "Mega", is an SI prefix, in this case equating to 10−12. At the time, there were virtually no rival products on the market, certainly none which had been shipped internationally, and it would take a great many years until Sega would face some serious competition (namely from VTech and LeapFrog). The Sega Pico was initially released in Japan in June of 1993. Unbeknownst to many, the Pico stands as one of Sega's most successful consoles in the region and received continuous support for over ten years. The Sega Pico was initially manufactured solely under the Sega brand; however, its success led Yamaha releasing a few versions of its own (similar to Hitachi and Victor's respective HiSaturns and V-Saturn Sega Saturn consoles). There have been numerous Sega Pico models, though the most notable change was that in 2001, where the brand was changed from "Kids Computer Pico" to "'Kids Communication Pico", with added internet functionalities. At this point all sales were began to be handled by the Sega Toys branch, which remains in control to this day. It is estimated that nearly 300 Pico games were released in Japan in total. The console was eventually discontinued in Japan in 2005. All Japanese games come in plastic clamshell containers. In North America, the Pico was less successful. Debuting in 1994, the console only enjoyed a few years of support before being discontinued in February of 1998. Only 20 Pico games were released in North America, each in cardboard boxes. The Pico won critical acclaim amongst Toy and Edutainment companies in the US and by 1996 the Pico had an installed base of 400,000 units, 225,000 machines being sold in 1995. Like the Sega Mega Drive, the North American distribution rights were picked up by Majesco after the console's popularity began to dwindle, and in 1999, Majesco reissued Sega Pico systems at the reduced price of $49.95, $100 less than the previous asking price. Supposedly the firm was meant to distribute more Japanese games in the region, though this never happened. In North America, the concept of "deluxe storyware" was frequently stressed across advertising campaigns, but at present it is not understood how this software differs from their non-deluxe counterparts. The Pico was released in Europe and enjoyed a similar run to the US model. All European cartridges are yellow, and (at least) English, French, German and Spanish variants of each game exist. Giochi Preziosi distributed the console in Italy, frequently opting for the sturdier plastic clamshell boxes found with Japanese games. The console was delayed slightly due to a dispute with Sega and UK distributors Tomy, the latter feeling that the £150 price point was too high (at least, compared to the Sega Mega Drive, soon to be dropped in price to under the £100 mark). Little is known about the Pico's European endeavours - it is presumed to have fared worse than North America as slightly fewer games were released in the region, though sources state its lifespan was about the same (1994–1998). At least one game, Professor Pico and the Paintbox Puzzle, was exclusive to Europe. Differences in language was a major hurdle for the Pico. Unlike other consoles where European software often came with language selection screens, the reliance on physical pages meant that every game had to be translated. In Brazil, the Pico was distributed – as all Sega products of the time were – by Tec Toy. Games were translated to Portuguese and were usually based on their North American or European counterparts. Tec Toy is known to have translated at least one Japanese game too - Hello Kitty no Tanoshii Butoukai. The Pico was also released in South Korea by Samsung. Performance in the region was surprisingly strong, with South Korean Picos receiving a large number of translated software (and accessories) from both North America and Japan. Samsung also produced a large array of Korean-specific software, and at least two versions of the console were known to be released in this region. Pico models have also been spotted in the large and complex region for which Sega uses the single name "Asia". Little is known about these models. Despite being of Sega's most popular consoles, the Sega Pico is woefully under-documented. Its target audience (for the most part, Japanese children under 9) and subject matter means very little is understood about the system and it is not widely desired by fans of retro gaming. Sega brought a handful of Pico games to the PC under the Paso Pico (ぱそピコ; abbreviating ぱそこん/パソコン, the Japanese equivalent of "PC", and Pico) label between 1998 and 2002. In Japan, the Pico was followed by the Advanced Pico Beena, a similar but more powerful device. Elsewhere Sega strayed away from trying to please the market for young children, preferring to back projects by LeapFrog and other similar companies. There was a relatively strong relationship between Sega and LeapFrog at one point, with Sega Toys distributing LeapFrog products in Japan, and Sega producing games such as Sonic the Hedgehog for the LeapFrog Didj. Because the Pico’s hardware is based upon that of the Mega Drive, several Mega Drive emulators (e.g. Kega Fusion) can in fact run Pico ROMs. However, support for non-hardware elements of the Pico experience, most notably game books, is dependent upon the programmer specifically adding support for these – as well as the person who created the backup of the game including all necessary files, chiefly scans of the storyware cartridge’s pages. Thus, Pico emulation has become notorious for being difficult, chiefly because of the need to scan and digitally represent each page of the game. In May 2008, a PC-based emulator capable of emulating the controls and games of Pico was released, under the name of PicoDrive. It came about due to the release of several prototype Pico ROMs, which were released by sonic:drx just over 2 months earlier. Soreike! Anpanman no Minna de Kyousou Anpanman! Yobeba Kotaeru Doraemon: Nobita to Himitsu Dougu o Mitsukeyou! Main article: Sega Pico/Magazine articles.